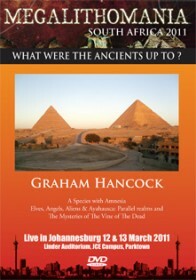 Graham Hancock is the author of The Sign and the Seal, Fingerprints of the Gods, Keeper of Genesis, Heaven’s Mirror, Supernatural and several other bestselling investigations of historical mysteries. His books have been translated into twenty-seven languages and have sold over five million copie worldwide. His public lectures and broadcasts, including two major TV series for Channel 4, Quest for the Lost Civilisation, and Flooded Kingdoms of the Ice Age, have further established his reputation as an unconventional thinker who raises controversial questions about humanity’s past. Graham discussed the global cataclysm at the end of the last Ice Age around 12,500 years ago and argued that our civilization, too, despite its technological prowess, might be poised on the brink of becoming the next Atlantis. He explored otherworldly realms and the sacred plant of the Amazon, Ayahuasca, and how this can transport you into interdimensional realities, as well as seeing clus within ancient cave art and visionary paintings.